"It’s Jack Kirby’s Demon, Charlie Brown!" This piece is from a comic convention program, circa mid-to-late ’70s if I recall correctly. Unfortunately, I no longer have the program in my possession, having sold it through the eBay long ago, but at least I still have this scan. 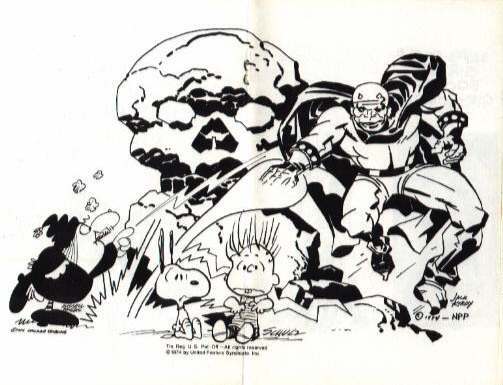 It looks to me like an actual jam piece by Russell Myers, Charles Schulz, and Jack Kirby, though I suppose it could have been cobbled together from various sources. If anyone has any more information about this artwork (like which program for what convention), I’d like to hear it. EDIT: Some of my kind, knowledgeable readers have informed me it’s from the 1974 San Diego Comic Con program. Thanks, folks!